The woefully out of touch writers of Scouting Magazine, the official magazine of Boy Scouts of America, suggest that parents only listen to CDs they buy from stores because when you listen to legal MP3s you risk confusing the boy scouts. So how can Scouters teach ethical behavior related to music downloading? One way: Set a good example. When you haul around Scouts in your car, for example, only play CDs that you've purchased. 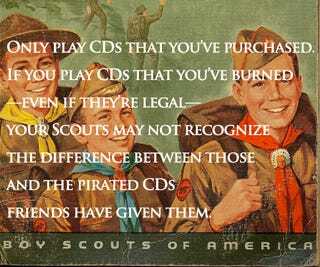 If you play CDs that you've burned-even if they're legal-your Scouts may not recognize the difference between those and the pirated CDs friends have given them. Part of the problem, Aretz says, lies in the Internet's free-for-all nature, where users get all sorts of content free-even information from newspapers that they would have to pay for in the real world. Bands like Radiohead have further complicated the situation by giving their music away or offering it on a "pay what you want" basis.